Experience this profound and creative workshop in Lisa’s beautiful Santa Fe studio. Beginning with a Tarot reading Lisa will determine your unique life cards. You will then be guided in a meditation to meet your tarot archetypes. From a deeply relaxed and open place you will intuitively create a piece of art from your visions. 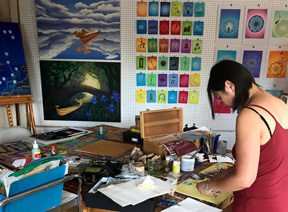 A variety of art supplies are provided such as collage material including tarot imagery and acrylic paint to work on a 24″ x 18″ hardboard panel. Artists and those who are new to art making are both welcome. Lisa offers instruction and feedback. You will return home with a piece of art that reflects your soul and will work as a guide to lead you through this life journey.